"What's worse, lookin' jealous or crazy? Jealous or crazy?" 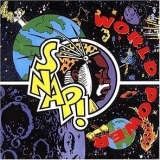 The Power (track) by Snap! World Power (this album) (1990). JANET JACKSON "ALRIGHT" & SNAP "THE POWER" RARE REMIXES 12" VINYL SINGLE PROMO!